Blog from Male, Maldives | Harper goes to France! Well, today we have no pictures, it was our first monsoon day. It poured on and off all day. 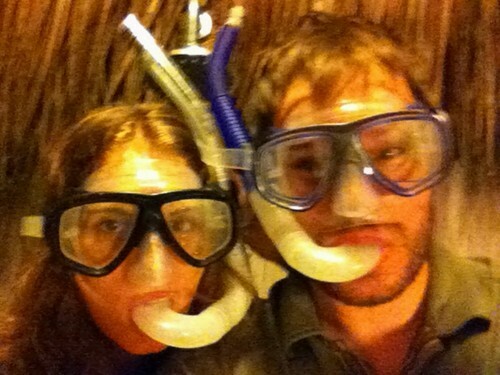 We did find a monsoon friendly activity though...snorkeling. The rain doesn't bother the coral or the fish. We took a short fifteen minute boat ride out into the Atoll to a reef. After some lessons from Scuba Steve (also known as Wes), I was ready. I did make him hold my hand the whole time because I remember watching something on Dateline about a newlywed bride who sank to the bottom of the ocean on her honeymoon because no one was paying attention. Better safe than sorry! We saw all kinds of fish and colorful coral, there were these purple clam like coral that were opening and closing their mouths when we scooted by, very cool. On the way home we ran into a school of dolphins that escorted our boat home, and then when we docked we saw black tipped sharks swimming under our dock!! Very very cool. When we got home I was sitting out back on our swing when a native man walked up to me holding a machete!!! We hit a bit of a language barrier, partly because I couldn't hear him over the banging heartbeat in my ears but eventually I calmed down when I figured out that he was offering to climb my coconut tree and cut down a coconut for me. Talk about customer service!